Mackerel with rhubarb has been regarded for years as a winning combination, but I didn’t know why until I made this. The relish is wonderful with all oily fish, and also with pork. Put the vinegar and sugar in a pan and bring to the boil, stirring to help the sugar dissolve. Add the spices and simmer for 10 minutes. Add the onion and cook, simmering, for 10 minutes. The onion will soften and the mixture become thicker. Now add the rhubarb and simmer gently for 4 minutes, or until just tender. Don’t overcook; you want the rhubarb pink and the pieces intact. Leave to cool. The mixture will thicken as it cools. Season the mackerel on both sides and melt the butter in a nonstick frying pan. Fry the fillets, skin side down, until golden, then carefully turn and cook the other side for about 3 minutes. Squeeze over some lemon juice. 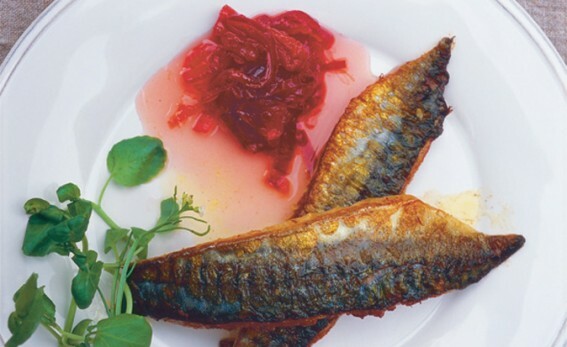 Serve the mackerel with the relish alongside. Put 1 tbsp white wine vinegar, ½ tsp Dijon mustard, salt and pepper in a cup, then whisk in 8 tbsp extra virgin olive oil. Add a pinch of sugar and taste for seasoning. Cook 200g (7oz) waxy potatoes until tender. Drain and leave in the pan, covered, to keep warm. Plunge 200g (7oz) baby leeks into a large pan of boiling salted water and simmer for 5 minutes. Drain really well and season. Slice the potatoes into rounds slightly thinner than a £1 coin. Carefully toss with the leeks, 12 cured anchovies (drained), 1 tbsp finely chopped parsley and about two thirds of the dressing. Cook 4 eggs in boiling water for 4 ½ minutes, then plunge into cold water and leave until cool enough to shell. Score 4 large mackerel fillets (each 150g/5 ½oz) 4 times across their width. Season, lightly flour and shake off the excess. Heat 2 tbsp oil in a nonstick frying pan and fry the fish over medium heat for 2–3 minutes each side. Divide the salad between 4 plates and set a mackerel fillet on top. Carefully shell the eggs. Break an egg over the top of each serving so the yolk spills on to the mackerel and drizzle with the remaining dressing. Serve immediately. Serves 4.